Bavaria Yachtbau presents the new website dedicated to the VIRTESS motor boat range. An innovative online configurator is an exclusive tool for the VIRTESS 420, the first flybridge yacht in the Bavaria range. Potential owners can easily select their model's material- and colour-options in the configurator by mouse click. A preview then reveals their new dream yacht. The Virtess 420 offers three wood options, two side-panel colours, four flooring materials and 12 upholstery types. These are combinable to suit the owners’ preferences. 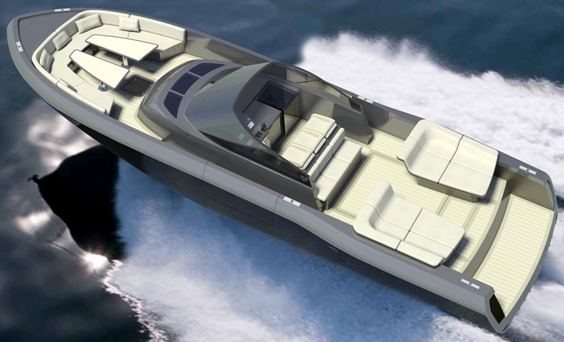 The configurator allows a customised design and a preview of each cabin on the yacht. The VIRTESS configurator offers an overview of all designs and is impressively easy and user friendly to use. As part of the continued efforts to build an organization with some of the best talent in the boating industry, Bertram Yacht has appointed Doug Reed as Senior Director of Human Resources. Reed brings over 30 years of Human Resources experience and has a proven track record in the development and implementation of lean manufacturing techniques in marine manufacturing. He began his career in the boating industry at Tiara Yachts as Manager of Employee Relations, he then spent several years in a range of key positions in the automotive sector. Reed’s most recent position was as Human Resources Director at Pursuit Boats, where he spent eight years leading all aspects of the human resource management functions and was a key member of the team that designed and implemented a lean manufacturing program for the S2 / Pursuit organization. In his new role, Doug will lead the Human Resources organization for Bertram Yacht at the new facility in Merritt Island. His mandate is to build an organization with the some of the best talent the industry has available and develop a rigorous operating culture based on lean manufacturing and continuous product improvement. Doug will work directly with the key members of the Bertram management team, including the President of Bertram Yacht, Alton Herndon, the Vice President of Manufacturing, Ken Beauregard, and the new Vice President of Engineering, Robert Ullberg. Bertram Yacht announced today a formal human resources partnership with Brooks Marine Group. The Newport-based recruiting firm will act as a strategic supplier of human capital as Bertram ramps up staff for their new Merritt Island, FL facility. According to the terms of the partnership, Brooks Marine Group will work closely with Bertram’s executive team to identify hiring needs for Merritt Island, and recruit talent as the new plant comes on line late this fall. The agreement also calls on BMG to support in the relocation of key Bertram talent and skills from Miami to Merritt Island, to help Bertram in securing new talent to develop best manufacturing practices and to secure outstanding and high caliber workforce candidates that are available in the Space Coast area. The Board of directors chaired by Ferretti Group Chairman Tan Xuguang has unanimously appointed Ferruccio Rossi as the new Managing Director. Ferruccio Rossi, who has been working for the Group as Riva Managing Director and Ferretti Group Country Manager since 2005, will replace Giancarlo Galeone, who has ended his mandate after CEO Salvatore Basile’s sudden death. Furthermore, Norberto Ferretti becomes the Honorary Chairman. Chairman Tan and Norberto Ferretti, even on behalf of the entire Group, thank Giancarlo Galeone for the important contribution he has always given to the Ferretti Group through his know-how and professionalism. These appointments will ensure the most absolute continuity to the Ferretti Group in the course of a further development that started after the power acquisition by SHIG-Weichai Group. SHIG-Weichai GROUP will closely cooperate with Ferretti Group, ensuring new distribution channels, financial support and other resources with the objective to support the Group at the international level, with particular reference to emerging markets. SHIG-Weichai Group, the Royal Bank of Scotland and Strategic Value Partners, Norberto Ferretti, the Administrative Council, the Executive Council, express their great satisfaction for the appointment of Ferruccio Rossi, a man of undoubted merit, with a strong financial talent and a tested experience in the nautical sector, which represents an important choice that will guarantee the Group to consolidate its leadership in the nautical sector and to continue in a process of growth that has characterized its 42 years of history. Formula boats recently took a few team members to the beautiful island of Bimini in the Bahamas for the Model Year 2013 photoshoot season; however, the first go-around wasn’t much to write home about. The first trip was mid-June and spirits were high. The boats looked beautiful, but a tropical storm moved in, forcing the crew to stop their boating efforts from Miami to Bimini. A “Plan B” was discussed, which involved boating near Key Largo, Florida—they desperately wanted to make the photoshoot work! Everyone loaded back up on the boats and the company van and headed in the direction of Key Largo. Once everyone arrived and checked in very late, they made it to their rooms for some shut-eye. The morning arrived quickly and they were on the docks by 8 a.m., only to be hit with more rain and cloudy skies. It was heartbreaking, but “Plan C” had to be addressed, which was to head home and discuss a new date—so that’s what the crew decided to do! After regrouping and changing calendars, boats and much more, the crew headed back to Bimini in mid-July. The second trip, we are happy to say, was a complete success! Although the temperatures were extremely muggy and hot each day, it was hard to complain after all the work it took to try again, and, after all, the Formulas were gorgeous and glistening in the Bimini blue water, it really makes one appreciate every moment of each day on and off the water! Now you can turn your Formula snapshots into a quick, exciting and personalized video that you can share with other Formula fans, your family or friends. It's easy to do with Discover Boating's Movie Maker App. Just go to Formula's Facebook page and click on the "Movie Maker" tab directly under the cover page photo. We look forward to watching your exciting Formula footage! Gulf Craft hosted an exclusive preview of its most recently completed Majesty 125 hull at its yacht manufacturing facility in the United Arab Emirates last week. The showing served as the Middle East premiere of the Majesty 125, offering VIP clients from the UAE and the GCC a chance to view the superyacht before it makes its journey to the French Riviera, where it will join its earlier delivered sister ship. The Majesty 125 is the company’s second largest model after the Majesty 135 which was premiered earlier this year, and is presently also moored in the French Riviera. Dometic Marine has recently supplied its Marine Air chilled water equipment for Horizon Yachts’ new 58 CAT. Built at the Horizon Yard in Khashiung Taiwan, the high performance multihull yacht has been installed with a 4-stage compact chiller to provide 96,000 BTUs for cooling and heating of all cabin and accommodation areas. Through its Marine Air brand, Dometic Marine supplies an extensive range of HVAC equipment to Horizon Yachts, including chilled water, direct expansion split gas and self-contained systems. The system installation on the new 58 CAT will be customised to include Dometic Marine’s innovative SmartStart controls, which reduce chiller starting amperage to ease the strain on the yacht’s generator. Jarrett Bay is excited to unveil limited edition Vineyard Vines neck ties featuring the Jarrett Bay & Habitat for Humanity logos! A portion of each purchase will be donated to Habitat for Humanity, in the late Joy Gaskill’s honor. This project is part of Jarrett Bay Boatwork’s ongoing fund-raising efforts to benefit the Crystal Coast Habitat for Humanity and help bring employee Joy Gaskill’s dream of funding a Habitat house to fruition. Jarrett Bay What a Summer! In our last news Jarrett Bay reported a slew of tournament success for the likes of Inspiration, Chainlink, and Bench Mark in June tournaments. Well in July, the Jarrett Bay family showed no signs of lifting their hands from the throttles. Edisto Marina Billfish Tournament: Micabe - 2nd place overall, 1st place Junior Angler, Barta Boys & Girl's Club Tournament: Builder's Choice - 1st place, Hatteras Grand Slam Tournament: Bill Collector - 2nd place, MegaDock Billfish Tournament: Micabe - 1st place, Bermuda Billfish Release Cup: Waste Knot - 2nd place, 1st place Junior Angler, 1st place Lady Angler, Cape Fear Blue Marlin Tournament: Chainlink - 1st place, Hatteras Marlin Club Invitational: Frequent Flyer - 1st place. The construction of the new 30-metre Mulder 98 Flybridge is currently in full swing. In consultation with the client, Mulder Shipyard commissioned Frank Laupman of Omega Architects to design the interior of this boat. Omega has previously designed the interior of the second Bellagio, which was recently sold by Mulder Shipyard. The Bellagio is constructed under the Built by Mulder label. Work is presently ongoing on the 30-metre aluminium hull of the new Mulder 98 Flybridge. Once the hull is completed, the next step will be the installation of the piping for the various systems. The entire interior of the yacht will be ‘floating’ in order to ensure optimal sound and vibration insulation. The interior consists largely of American walnut, both stained and natural, and the design comprises striking contrasts in both colours and materials. For instance, there are many leather panels, while various brushed stainless steel details create a modern ambiance. The entire interior is built in house by Mulder Interior Construction, guaranteeing perfect workmanship and quality. The construction of the first Bellagio is in full swing and the yacht will be completed in the course of this year. Furthermore, a second Bellagio was sold last month to a client in Russia. 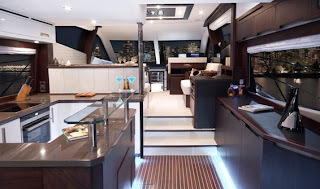 This yacht will have an interior designed by Omega Architects, just like the Mulder 98 Flybridge. The interior will be bright and modern, with a very open character. The second Bellagio will be used by the owner for daytrips. Mulder Shipyard has high expectations from this new model. Mulder Shipyard is currently working together with several other naval architects in addition to Omega Architects. This portfolio of designers makes it possible for the yard to translate all the wishes and ideas of its clients into a superlative design in the best possible way. Outer Reef Yachts of Ft. Lauderdale, in cooperation with Setzer Design Group, proudly brings to market a new series of tri-deck motor yachts. The Outer Reef “Explorer Series” will range from 92’ to 115’. The Explorer Series is designed on a semi-displacement platform with moderate draft so as not to limit shallow water cruising such as the Bahamas, or coastal cruising around some parts of Europe, yet be capable of ocean crossings with sufficient fuel capacity and unlimited ocean classification. Secondly, being a semi displacement hull, higher cruising speeds can be achieved at lower fuel consumption than a traditional full displacement yacht. 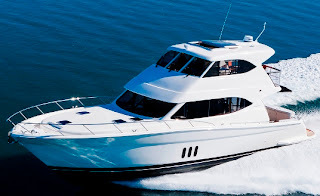 Outer Reef Yachts is well known for their series of high quality long range motor yachts up to 90'. This new series of motor yacht will be built at the same partner facility as all Outer Reefs, Tania Yacht Co. in Kaohsiung, Taiwan. The collaboration represents an exciting partnership between the two U.S.-based companies. As a four-time recipient of the International Superyacht Society Award for “Best Power,” in lengths from 78-140,’ the 21-year old Setzer Design Group brings a unique experience in producing stylish, high-performance designs in this size range. 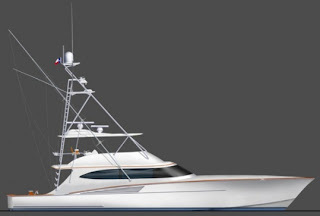 The first of the Explorer Series, a 105' model is currently in contract negotiations and is expected to be delivered in late 2014. Riviera’s night of nights was all about recognizing marine industry excellence and it was the enthusiastic, proactive and exceptional customer service from R Marine South Australia that earned them the esteemed Overall Dealership of the Year award for 2012. The annual Riviera Dealer Awards have been running consistently for the past 18 years. Pete Devery from R Marine Sydney was awarded the Salesman of the Year award, Highest Selling Dealer of the Year went to R Marine Sydney and the award for Service Excellence went to Steve Domigan from R Marine New Zealand. R Marine South Australia received the coveted Overall Dealership of the Year, which came as a welcome surprise to dealer principal Paul Harrop. He said it was a great achievement for such a young dealership. Steve Domigan from R Marine New Zealand received the award for Service Excellence by an Individual for his work ethic and continuously going the extra mile for Riviera owners. Mr Domigan said he felt honoured to receive the award. R Marine Sydney was awarded the Highest Selling Dealer of the Year award for their sales success over the past 12 months, while Pete Devery was awarded the prestigious Salesman of the Year award for the third consecutive year. R Marine Sydney dealer principal Michael Joyce said winning these awards were a real credit to the team. Pete Devery began his career in the marine industry 14 years ago and has achieved the Salesperson of the Year award for the past three consecutive years. Pete said it was extremely gratifying to receive such a prestigious accolade. Riviera’s dealer relationship manager Peter Welch said the annual Australia/New Zealand Dealer of the Year awards recognised excellence, outstanding achievement and dedication to Riviera’s loyal owners and brand. The first model in Riviera’s new SUV Collection, the 445, took centre stage at the 2012 Sydney International Boat Show, where she made her debut performance in front of thousands of boating enthusiasts. 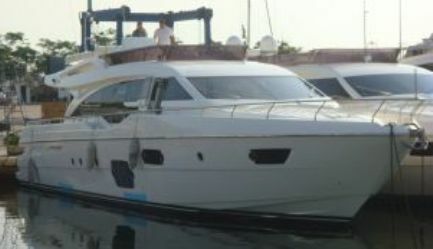 The 445 was one of the stars of the show with Riviera taking two deposits for this new model, one bound for an owner in Adelaide and the other bound for an owner in the US where she will make her American debut at the 2012 Fort Lauderdale International Boat Show held from October 25 – 29. This new model lead Riviera’s star studded cast of impressive new boats, including from the Sport Yacht range; the 5800 with IPS or Zeus, 5000 with Zeus, 4400 Series II with IPS and the 3600 with IPS; from the Flybridge range; the 63 Enclosed Flybridge with shaft drive, 53 Enclosed Flybridge with Zeus or IPS and 43 Open Flybridge with IPS; and from the Belize Motoryacht range; the new Belize 52 Daybridge. Riviera’s director of brand and communications Stephen Milne said there was strong interest in Riviera’s latest models, including the new 50 Enclosed Flybridge which is due for release mid 2013. Riviera also won the award for Best Overall Display on the marina, which was extremely gratifying for our hard working team who put a lot of effort into showcasing the latest Riviera and Belize models.The newest models from Australia’s most awarded luxury boat builder are now preparing for their next round of Boat Shows, including Auckland, NZ in September; Cannes, France in September: Fort Lauderdale, Florida in October; and the Gold Coast International Marine Expo in November. Sunseeker International are delighted to announce they have become an official partner of local premiership football team Southampton FC. Sunseeker will be supporting the Saints' journey in the highly competitive Barclays Premier League for at least the next three seasons. The agreement includes Sunseeker branding on the clubs newly-installed luxury dugout seats, which fans got their first look at during Saturdays game against Wigan Athletic. As well as on the interview boards which ensure the global television audience the premiership attracts gain exposure to the famous Sunseeker brand. The latest milestone in Sunseekers illustrious boat building history took place last week when the completed hull of the first 155 Yacht moved location within our Poole Quay facilities. The operation involved meticulous planning and execution with literally no room for error given the monstrous dimensions involved. As expected, the move went without a hitch and Hull #1 is now safely in the 'fit out' stage of her build. This yacht represents many 'firsts' for Sunseeker, not least of which is the fully painted finish she'll be receiving later in the build. Because of this, a clear gel coat has been used in the hull construction, the resin showing through and making the hull appear brown in colour. With the almost unlimited colour choice available, we're keeping the finished colour for this particular yacht under wraps for the moment. The Sunseeker 155 Yacht is the largest to date undertaken by the Poole Shipyard, which can now soundly lay claim to being the only production boat builder in the world to be manufacturing a range of boats from 40 to 155 feet in length under a single brand. Vicem Yachts, the premier Turkish builders of luxury classic motor yachts and mega yachts, announces that Sarasota Yacht & Ship has been named the Official Distributor for the Americas, which includes North, South & Central America as well as Canada and the Caribbean. A 26 year old company - with high calibre professional key figures from the US yachting industry - based in Sarasota, Florida. Gary Smith, Senior Partner with Sarasota Yacht & Ship, replaces Dave Mallach. Vicem Yachts and its whole team takes this opportunity to sincerely thank Dave once again for his strategic support, great competency and complete passion in every aspect of his time with Vicem. The recent Ocean City Marlin and Tuna Club Overnight Billfish Tournament, held out of Ocean City, New Jersey, resulted in 114 releases from a field of 36 boats. In addition to the releases, a wide variety of tuna, wahoo, dolphin and mako were brought to the scales. New Gretna's own Viking 70 demo won the tournament with an all-time record for points. Captain Ryan Higgins led his team to 26 white marlin releases, another tournament record, along with two yellowfin tunas. The crew was on such a roll, they released another five after lines out. Richard Ryon's Viking 50 Anthracite released 17 whites and two yellowfins placing them in Third Place overall. 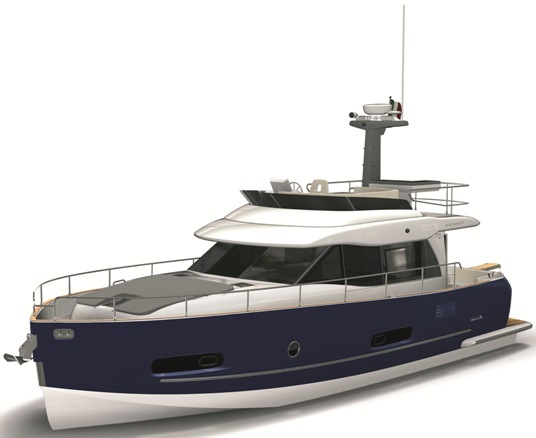 It's been a few years since Cantieri Navali dell' Mediterraneo launched a new model, but now this young Italian Rome builder comes with the interesting 43 Continental set to be shown for the first time in Cannes. As usual the central Italy Rome area shows its innovative drive, and CNM with its modular interiors, and opening side decks to extend space outside has been a very interesting builder to watch in the past final part of the first decade of the new millennium. The CNM 43 Continental will be the new entry level for this builder, and again traits from the bigger models are all to see here; from the side opening bulkheads to full use of the deck from fore to aft as the Tender version of the 50. Inside surprisingly the 43 Continental will sleep four persons in a cabin and a convertible dinette. Considering the space outside that is not bad at all. The 43 Continental as the bigger sisters is also offered with various custom options from a hard top to a different layout of the exterior. Standard power is from twin Yanmar 480hp diesel engines which can give 42 knots max with line shafts, and 48 knots with the Arneson Surface drives option. But again as the bigger CNM I do accept to see a big variety in engine, propulsion choices available for the 43 Continental. It's been just over a year since Galeon launched a fifty feet plus motor yacht model, which was its new 780 Crystal flagship, but the Polish builder has since then presented so much under 43 feet models that this period looked about double to that in my mind. The new 550 Fly comes from hands of since 2004 Galeon collaborator and World class British designer Tony Castro, and show the dynamism of the Polish builder to offer a top quality motor yacht which impresses and creates leadership in areas of its layout. If you want one of the most spacious astern galleys, and among the largest full beam midships owners stateroom the 550 Fly definitely is awaiting your inspection. The owners room is to admire for the central position of the queen size bed which looks in the better position to aft, beauty desk, and the chaise lounge. Other impressive feature of the 550 Fly is also the third guest cabin which features two single berths, but one is of a french bed size, and the twin crew cabin with dedicated shower head to aft which features nothing less to the usual guest cabin. 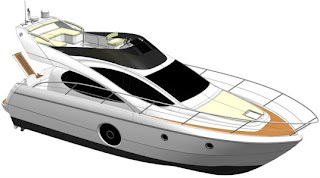 So if you really want the 550 Fly can be regarded as a four cabin motor yacht. The exterior spaces of the 550 Fly have also to be mentioned; with an nice aft deck featuring an L-shaped settee, and the flybridge with C-shape dinette, wet bar, sun pad, and port side helm station. Standard power is twin Cummins 710hp, and Volvo 600 IPS or 900hp with line shaft propulsion available as options. Vivante continues to upgrade its line and coming from the launch of a 55 feet flagship in the fall of 2011 shows renderings for a second in size 50 Hard Top model. This new Vivante 50 continues the Dutch builder following for a modern topside classic hull lines mixture, with a very practical and well laid out three double cabins interior. The living of the 50 is to be located on the main deck with a saloon and entertainment unit opposite. A galley is to be find below in the middle of the lower deck. As all Vivante the 50 Hard Top is build of steel with a hull thickness of four millimeter, and will feature a round bilge bottom shape with a flared bow. Power is a single Vetus 210hp. Worth to note is also the interesting competitive price of the Vivante models which compares quite well with a similar sized fiberglass build. Sea Ray shows a blurred picture for the upcoming new 510 Sundancer, to be unveiled in the builder's first Homecoming celebration coming mid September. In this event another 37 feet outboard powered cruiser 370 Venture will also be presented. Not so much details are so far given of this new sport yacht Sea Ray 510 Sundancer, but what we can gather from this pictures is large view windows everywhere, patio door closure for main deck, and up down bathing platform. Worth to note that the US builder was among the first to use this feature back in the nineties. May be someone at the event can give us some more details later on. Ritchie Howell from North Carolina USA continues its pursuit in building custom sport fish cruisers and yacht. Here the builder shows a project for a 60 Express which shares a similar hull with the Convertible series of the same length. Designed by Matthews Yacht a lot of innovation seems to be going into this project into its layout, propulsion and systems. The lower deck will in fact feature a full beam owners stateroom, with crew quarters located to fore, and large galley and saloon in between. Two en suite heads will serve the owner and crew quarters respectively. The other latest innovations in this model will come from its propulsion which will be the large ZF pods system, and the use of a Seakeeper gyro stabilizer. 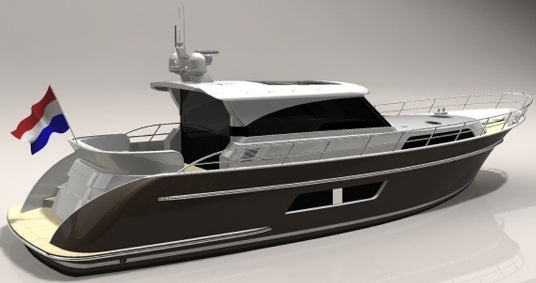 Twin Cats C18 Acert will power the new Ritchie Howell 60 Express to a 40 plus knots of top speed. Blu Martin was one of the first Italian builders to put itself on the map for less to fifteen meters hard top sport crusiers, and today deserving so the comnpany features a line up of six models all with an integrated hard top minus one. The new ST 48 presented at the fall of 2011, marks a gap fill for Blu Martin between the the larger 52, and smaller successful 13.90 Sea Top. In a length just a bit short to fifty feet the Blu Martin 48 ST offers a very impressive three cabins plan, with a large owners suite to fore, and two guest rooms to midship. The living is all dedicated on the main deck, with a dining table seating six. All the areas of the Blu Martin ST 48 are in fact made for making six persons living in comfort. Power as many areas of the ST 48 and all Blu Martin models comes in a large choice offer from five engines starting at 370 up to 575hp from Volvo, Cummins, and Yanmar, and three propulsion choices; IPS pods, ZF Zeus, and traditional line shafts. 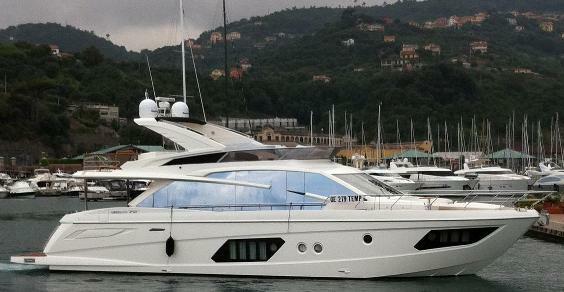 At the Genoa Boat Show 2012 will be present the new Azimut 54, heir to the 53, one of the biggest hits of the latest models coming from the Italian builder. On the project rendering and builder notes so far we can say that the 54 versus the 53 comes with a renovated exterior design, having far more sports characteristics than its predecessor and is also characterized by new living solutions mostly on the main living deck. In addition to design and complete renewal of all the details of the interior decor, Azimut 54 has a main deck completely renovated in the forms and furnishing. The Azimut Style Department has indeed redesigned the seats thus giving more comfort and functionality to the main internal areas and has also given the galley to port side a new look, serviceability and maximum utilization of storage. The Lower Deck has been little changed from the 53 surely as this is a best seller in its category, thanks to a configuration of the cabins with unparalleled heights. The master stateroom amidships in fact enjoys one of the best layouts thanks its full height and beam, and breath taking sea views and natural light with the the three large vertical windows in the hull. So far Azimut has not announced engines for this upcoming new model, but I do imagine 730hp MAN engines with a top speed of 33 knots which is the power featured in the 53 this model replaces as from the coming fall. 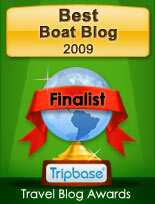 Grandezza has made 2012, an inspirational year to get the attention of boaters World wide. The 27 OC is another well looking hard top sport cruiser, which with some less Scandinvian details see safety railing, and better to CE C certification could have even got a World wide global attention. 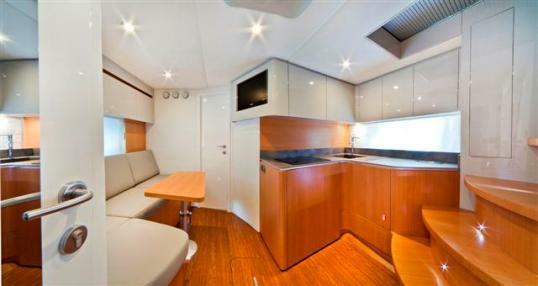 None the less the Grandezza 27 OC should be praised for a clever design and well laid out lower deck accommodation. Like in bigger boats, the Grandezza 27 OC has made a living on the main deck with galley and dining table all located under the extended hard top. Below is space for two double berths sleeping four, plus a seperate shower head located to port side. Power is a single petrol gas 320hp or diesel from 220 up to 300hp. 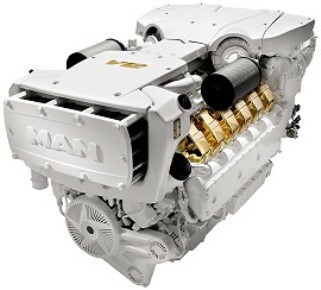 MAN presented its new V12-1650hp marine engine for yachts and pleasure craft in the 50 to 100-foot class. With its 12 cylinders and 1,650hp or 1213kW it closes the gap in the upper power segment between the V12 rated at 1550hp and the top-rated 12-cylinder unit with 1800hp. At only 2400 kg the low weight of the V12-1650 ensures an excellent weight-to-power ratio of 1.45 kg per hp and thus maximum efficiency in marine operation. The V12-1650 is the ideal engine for yacht owners who are looking to cruise in comfort and above all to cover longer distances overnight. The reason for this is its maximum torque of 5,520 Nm, which is available at speeds even as low as 1,200 rpm. MAN yacht engines are also well known for their compact dimensions and thus give architects and boat-builders a good deal of room for manoeuvre. The V12-1650 merges well into the array of space-saving engines and features convincingly compact dimensions of 1,667 x 1,150 x 1,350 mm (length x width x height). MAN's engineers have achieved this by, among other things, using a weight and space-saving SAE1 flywheel housing. One advantage for installation of the engine at the boat-builders is the exhaust system, which has one central outlet. The water pump is driven by a gear instead of a V-belt, which considerably reduces the maintenance effort. Beside this all parts requiring servicing, such as fuel and oil filters, are so efficiently positioned in the V12-1650 that they are easily accessible from the centre gangway. Heesen Yachts delivers My Secret, a 46.7m super yacht previously titled as project California due to her interior style. The 46.7m features a steel hull with a full displacement shape. Her luxurious interiors are by Bannenberg and Rowell, with the exterior by Omega Architects. The interior designers focused on a vintage California style layout of the 1940s and fifties. Her interiors will feature a luxurious five cabins layout. Power is from twin 1341hp MTU which reach a max speed of 15 knots, and a cruise of 12. 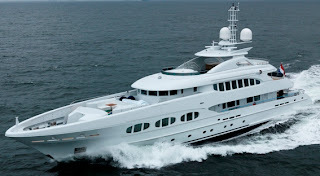 Heesen hull number 15347 is the fifth super yacht delivery for 2012. Absolute model number nineteen is its new flagship the expected 72 Fly, which takes its length and beam a bit further to the 2008 launched 70 STY. We are speaking of centimeters here, but considering that only two years ago Absolute launched its first flybridge yacht with the 50 Fly it is impressive the great strives forward this Italian builder has made in its just celebrated first decade. The Absolute 72 Fly is a flybridge motor yacht, and continues the Italian builder extensive use of window surfaces, and IPS pods propulsion available on all its models minus the 40 STC. The interior of the 72 Fly presents itself with a spacious traditional below with four double cabins and three shower heads serving the guests. The owners room is located to midships, VIP suite to fore, and two twin cabins in between. A twin crew cabin, with a spacious shower head is located to aft. On the main deck Absolute shows good thinking thanks to a single level plan, an open galley to port side, which with the aft bulk head separates itself from the saloon, and the view windows making for uninterrupted view from forward to back even when seated on the saloon. The exterior areas are also a following to the latest trends from the C-shaped settee to fore deck, to the aft part of the flybridge which has a free area which can be equipped with a free hanging shower. Power for the Absolute 72 Fly is twin Volvo 900hp with IPS pods propulsion which give a max speed of 31 knots, and a cruise of 24. Dale presents the project of the 41 Classic. Based on the famous semi planning hull, which features a lot of pilot boat, which are married with lines also coming a bit from a down East lobster looks. Dales says that the 41 will feature a Nelson hull. So far the British builder is passing very little details, but I do accept to see some features of the 2004 launched 45, which was a turn around model from this builder and has received much praise from the public and dedicated press. Staying with the market, clients demands, and latest trends will be key to smooth running in this current recession period. 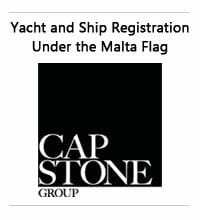 Blue Game shows this again, not only in its impressive range of custom offers to its cruisers and yachts but also for reacting quickly to market demands. Launched in 2011 the BG40 is now available with an up and down bathing platform, making tender launch, and swimming much easier. This new options adds another edition to four exterior, and two cockpit choices. The BG40 sleeps a total of six persons in two separate midships located cabins, plus a convertible dinette. Top speed is 34 knots with the standard Cummins 425hp, and ZF Zeus pod drives. Having currently an 80, and 84 in building stages Bayliss shortens a bit its length downwards and presents a project for a 77 feet which just recently started construction. 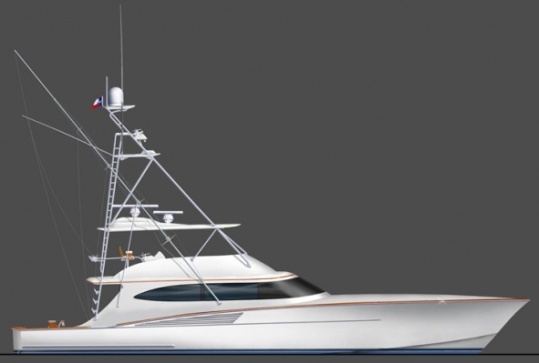 Designed by Bayliss designer Robert Ullberg, this new custom sportfish will feature a four double cabins, three heads interior. A centre console flybridge, and a must have mezzanine to aft are also traits of this new build. Outside is also a curved reverse shear line which pays high duty to the Caroline heritage of the builder. Build in cold molded, jig method B18 will be named Clean Sweep, coming from the previous Bayliss B8 owner who upgrades by nine feet. Power will be from twin 2600hp MTU, with estimates of a max speed of 44 knots being on the cards. Atlantis continues its range renovation with the project of a new 34 set to be launched coming October. 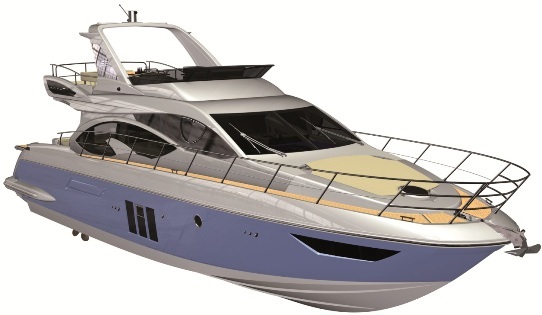 As is all the new range since the launch of the 48 in 2010, the latest Atlantis model is again a work of the Team from Neo Design of Biaggi and Salvetti. This new entry level Atlantis follows a lot of the features seen in last year introduced 38. For example the 75% hard top covered aft deck resembles a lot of the features seen in this much praised latest 38 model; from the C-shaped settee and chaise lounge to port side, to an L-shaped wet bar and helm to starboard. Down below things change more as the Atlantis 34 follows the layout of a Vee shaped settee which converts to a double to fore, shower head to starboard, galley to port and a twin cabin to midships, this sleeping a total of four. Named Lucia-M, the Jongert 3900MY is the first motor yacht of these dimensions ever built by the more renowned Dutch sailing yacht builder. Curiously Jongert actually started as a motor boat builder, before moving its sights to the today much renowned sailing yachts. 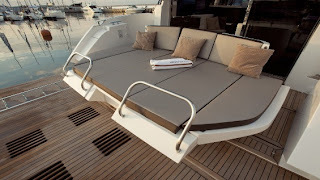 Much attention has been paid to comfort during the design of the yacht. The motor yacht line has been developed by the yard at the specific request of several customers who appreciate the design of the Jongert sailing yachts but prefer a motor yacht. The Lucia-M is the owner’s fifth motor yacht. 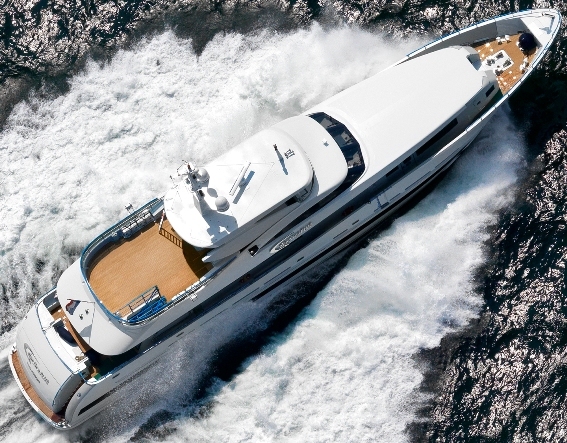 Designed by Guido de Groot the 3900MY, is an aluminum built two decks and a half fast super yacht. Jongert 3900MY features four double guest cabins, with huge spaces dedicated to the owners room on the forward part of the main deck. Power is from twin 4185hp engines which give a max speed of 28 knots. Finally, Camuffo from Venice Italy considered as the oldest boat builder in the World has its website. The Camuffo generation of shipbuilders started in 1438 in the island of Crete in the East part of Mediterranean sea basin. Here, El Ram Mufti Camuffi was shipwright on the Serenissima, a job followed by his son Pier Antonio in 1451. Two years later, in 1453 at the fall of Constantinople Pier Antonio will move in the North East of Italy in Chioggia. The current descendant of the family Camuffo, now in its eighteenth generation Marco was born in 1932. Marco with his father Luigi will start the evolution of the current Camuffo, dedicated to fast and efficient deep Vee cruisers and yachts. Camuffo are built in wood, with the Lamellar, method. This building system which started in Italy is a traditional method of putting different pieces of wood together to reach the desired thickness, glued with special Eco-resins which has no reverse effect and has also anti worm properties. Camuffo currently offers three motor yacht models from the C55 Flying bridge, C60, and C65. Camuffo new web site is available only in Italian language, and takes you around with the following buttons; Home, Azienda (Company), Il Legno (The Wood), Tradizione (Tradition), and Modelli (Models). Lets hope for a full English version very soon. Fairline presents the new 62 Targa GT project, a further extension of the 58 model of the same designation. This new Targa flagship keeps a lot of the praised lower deck layout which chooses for a forward owner stateroom, and two double guest cabins to midships, with the main difference from the 2009 launched model coming in the exterior aft deck. Here the Fairline design team went for a full Mediterranean layout with a big large central located sun lounger, which can stow a tender underneath, and having an extended bathing platform to stern. 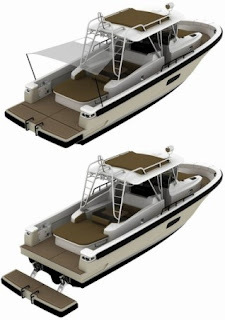 This makes it possible for the new 62 Targa GT to carry two tenders, if one desires so. In this layout a single crew cabin is available to fore, and for the tender garage the second aft crew cabin option seems lost in the plans although it is on a To Be Confirmed basis in the specification. Three engine options are available for the 62 Targa GT; twin Volvo 800 or 900hp, and MAN 1200hp. Speed estimates are not yet announced, but is not the first time that a longer hull, even though a bit heavier can actually copy those of the smaller version. Following the presentation of its new 39 CA flagship Finnish builder Grandezza continues with another very interesting medium sized sport cruiser, the 33 OC. Good looking outside, and with some interesting features, I do think that better European exposure was missed with this new Grandezza 33 OC, and this is for two reasons. The CE C certification, and the railing which goes the Scandinavian route to come out from the side deck and not being put on the toe rail. May be not so much a problem for the first, a little bit more in the second case I think. An interesting layout with two double cabins, and a shower head below, with a well sized galley located under the hard top differentiates this model from most of the competition. Curiously while the Grandezza is build in Scandinavia I think this works particularly well in the med, and thanks to the extended hard top also up North. Power options are a four Volvo engine choices from single Volvo 330 or 370hp, to twin 200 or 220hp with stern drive propulsion. 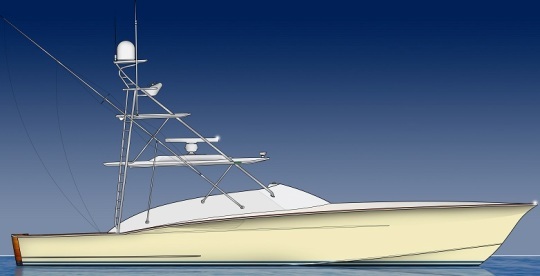 Cranchi presents a project for the Fifty8 HT, another new member of its ever important Yacht Class range which by the end of 2012 will feature six models from 54 to 66 feet. As is usual to Cranchi a lot of Research and Design goes in each model release, and even tough the Fifty8 HT is the sleek sports version of last year released Fly model of the same designation I am sure this is again the case. Cranchi Fifty8 HT follows recent trends of a sports yacht with accommodation and comfort which competes to that of a flybridge boat. 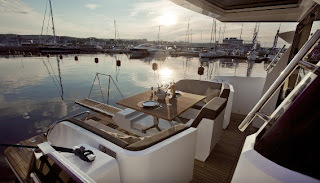 The interior layout of the Fifty8 HT follows that of the Fly version with a living on the main deck, and a lower deck dedicated to three double cabins and two heads, of which one en-suite for the master room. The owner stateroom located to midships has a bed which looks to port side, and having a breakfast table opposite. The main deck which is in a split level shape surprises for its central helm which is accompanied by a dinette to port side, and astern galley located by the patio door. Power options are twin Volvo engine choices, a 600 or 700hp with the second generation IPS800 or 900 choice. Speed estimates are not as yet given, but imagine a max of 32 knots possible with the big engine choice similar to that of the Fifty8 Fly model. One year after the launch of the Key Largo 34 and 27 IB, Sessa boosts more its Open line, introducing the stern drive version of the 24. This new small Sessa 24 Key Largo IB, strongly expresses the effort and the will of the North Italian factory to strengthen the open range segment, offering the market a small boat characterized by large spaces, created for those who want to enjoy every comfort without sacrificing design. The squared-off bow together with the aggressive lines of the cockpit area, designed by Christian Grande, Sessa Marine Group designer for many years, remind those sophisticated and typical drawings of sports cars. Versatility is a factor in any yacht but more so in small sizes. The 24 Key Largo offers loads of it starting from the aft settee which can become a huge sunpad, a big folding bimini, and a cabin with bar unit able to accommodate a forty liters fridge, and a vacuum flush toilet on request. Power will be from a single Volvo petrol gas engine of 260hp with stern drive propulsion and top speeds of 40 knots. Heesen Yachts is proud to announce the delivery of the all-aluminium 35m Galactica Plus, a fully custom semi-displacement super yacht. Her elegant exterior lines as well as her minimal yet welcoming interiors have been designed by Frank Laupman from Omega Architects. In 2011 Heesen delivered six magnificent superyachts to their owners, ranging in size from 37 to 55 metre. 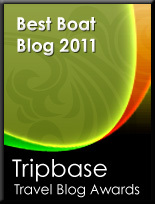 So far in 2012, they have delivered five vessels including the two already described. Heesen Yachts has ten motor yachts on its order book with deliveries scheduled through 2015. Hull number 16134 is powered by twin 2600hp MTU which reach a max speed of 27 knots, and a cruise of 11 give a range of 1400 nautical miles. Aqualum from Argentina presents its new virtual World wide showroom. Located in Tigre, Buenos Aires province, Aqualum has been one of the successes coming out of South America. The company in the past decade has had a good success with its 35, and 46 models. Now the company has a line of new projects coming, made to expand and complete its range. Aqualum current line up features four models from 35 to the still in project 55. Its latest model is the 38 designed by Fabian Conte. Aqualum new web site is available in Spanish and English language and takes you around with the following buttons; About Us, Aqualum 35, Aqualum 38, Aqualum 46, Aqualum 55, A Mix of Pleasures, and Aqualum Network. After a journey which showed PowerYacht displaying again the Inbuild process of a Galeon, we can say the 430 HTC is ready for its important Cannes boat show debut. Based on the hull and interior layout of the 420 Fly, the 430 HTC diversifies itself for its two opening sunroofs; aft and inside, and the modular settee at the cockpit. The modular aft deck is a very interesting piece of engineering which can be a dinette, two side beds, or one big central sunpad. 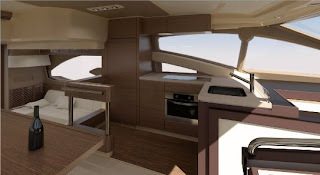 With the 430 HTC the Galeon design team also presented new side window profiles which differ from those of the 420 Fly and are a bit bigger in size suiting better to the more sport nature of this model. Inside the superb layout of the 420 Fly with three double cabins below with owners room to fore and two guest to midships is repeated. 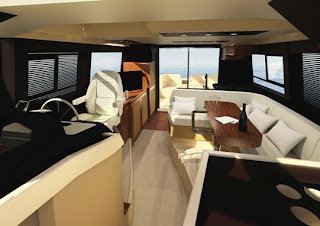 The living of the 430 HTC is on the main with a split level area have a saloon settee with entertainment opposite and the raised area featuring a port side located C-shaped galley with helm station on the other side. Galeon is known for offering various wood options in its model, but hull one of the 430 HTC has been fitted in modern Wenge wood, which fits very well with the dark aggressive color of the exterior hull. As with all its models Galeon offers a lot of engine choices, eight is the number here, and starts from twin Volvo 260 and go up to 435hp. The Azimut Magellano project started over three years ago with the innovative scope of the orange colored Ken Freiovkh designed 74, which after its launch in Genoa show and special presentation in Varese marina, went for a special tour for two thousand nautical miles of all the Western Mediterranean sea up to the pillars of Hercules in Gibraltar, Turkey and back up to Italy in Autumn. The 50 Magellano with all that important size of just over fifteen meters, which sits nicely followed in the fall of 2010. Now comes the entry level 43, again a design as the bigger 50 of Italian designer Cor D.Rover, with the under water shape following the innovative dual mode semi displacement hull of Bill Dixon as used in the bigger Magellano models. The new entry level 43 Magellano will be offered in a two versions a flybridge, and Hard Top version which PowerYacht will present at a later stage. Making way for practicality the 43 Magellano will offer a three cabins; with an owners suite to fore, and the third cabin being a single berth to starboard. An interesting feature which will be the first seen on a yacht this size will also be the astern galley located on the main deck. Apart the practical aspect of this, this also frees the area opposite of the dinette to be used as an entairtainment unit. The flybridge of the 43 Magellano offers a C-shaped settee to port, helm on the other side, and a free aft area. Construction wise the 43 Magellano shows Azimut putting emphasis for a stronger to usual construction with a displacement of over seventeen tons with not so big 305 or 355hp twin Cummins engines, and also a large quantity of 1800 liters of fuel reserve. Performance should be a top speed of 22 knots with the bigger choice. World wide presentation of the 43 Magellano is in Cannes coming September. 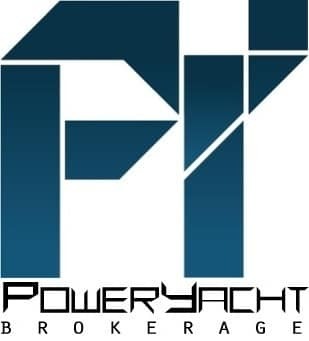 I have always been a keen supporter to this Italian boat show, who is also one of the largest in the World, and offering a wide variety of boats thanks also to the competitive nature of the Italian boating market. In fact I have been to the show in five past occasions; 1995, 1997, 1999, 2000, and 2004. If you ask me what boat show to visit, I would definitely put Genoa on top of the list. In its fifty plus years of history though I think the next edition will be the most difficult to handle for the show, and the organizers. First of all we have already some important companies who announced are gonna miss this years edition. 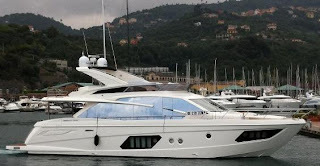 So far I know two big Italian builders who announced they are gonna skip this years Genoa boat show; Cranchi and Sessa. Others like Queen Yachts have also shown not to participate at the show, as the new 50 Fly model seems not to be presented at the show. Very interesting in all this was also the Sessa press letter where the company says that in the current status of the Italian government stance on yachts, add new tax introduced in May participating in Genoa is not very fruitful. From my personal view point I also add but with sadness that Genoa does deserve what happening here. The show increased its exhibition fees in both 2008 and 2009, and the incentive for visitors to visit have not been very good. I still as at today cannot understand how a one hundred miles distance hotel to the show, can charge triple or quadruple during the exhibition nine days. For one of the largest shows to succeed and survive at this moment in time, Genoa has to return to think with a competitive edge something it did a lot in the nineties, and also remember that those visiting the show are not all millionaires. I add that this thinking should also come to the services part of the industry, which especially in the Med in the last years had no respect to the end user duplicating and triplicating fees in matters of some time. Yes berthing and yards fees are surely the main to blame in this!